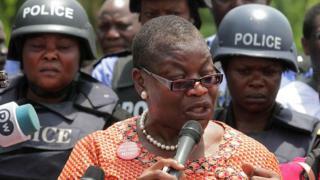 Former World Bank Vice-President Oby Ezekwesili carri enta social media on Monday to draw ear give Africa kontri wey dey take money from China because dem no need am. Why Cameroon dey cari 100 businessmen go China? Ezekwesili wey also follow start Transparency International, accuse African leaders say dem no dey reason di deals behind dis loan money well well before dem collect am from China - say na dis kain money put African kontris for touble before before. From May 2007 to May 2012, she serve as Vice-President of di World Bank (Africa division). Dis na afta she work for di goment of former Nigeria president Olusegun Obasanjo as Federal Minister of Solid Minerals and later Federal Minister of Education. So Ezekwesili suppose know wetin she dey tok wen in one of her post for Twitter, she tok about how politicians for African kontries dey do di mistake wey those before dem do for 1980s and 1990s. But some pipo don begin reply give di former minister for her tweet, say Buhari goment need di money to put inside infrastructure development - even though Ezekwesili no mention Buhari by name for her posts.